Start reading Moon Girl and Devil Dinosaur Vol. 1 on your Kindle in under a minute. Both my 6 yo super-hero obsessed daughter and 9 year old son enjoyed it. It is great to see a super hero my daughter can relate to. Not to give away to plot, but there is some conflict form unexpected places, so this book led to some interesting conversations about people being misunderstood and how to work together. Make sure to take the time to talk through what happens in the book with your kids, because it is not just a clear good vs evil plot. I really liked the style of this series. It's a story set in the Marvel Universe with fantastic characters but with a very grounded core story of finding a place to belong and the fear of change. Moon Girl is a kid genius named Lunella who has the inhuman gene that threatens her to change when exposed to terrigen mist. She meets a dinosaur chasing a group of prehistoric cult thugs called the Killer Folk who worship a god embodied by an alien device. 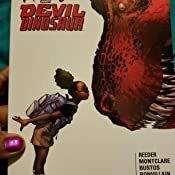 Moon Girl tries to get the device, thinking it would help her combat the mist, and ends up partnering up with Devil Dinosaur to chase down both the device and the Killer Folk, all the while dealing with suffering normal school life. The first six issues included in this volume sets up the story well and gives credence to Devil Dinosaur returning to our present day while introducing a spunky girl who refuses to give up. The threat that drives her is a great link into main Marvel continuity as well as slightly explores the thoughts of a latent Inhuman on becoming mist-ified. The Killer Folk becoming their own gang in a present day city is inspired enough to be amusing with interestingly dangerous possibilities if they don't just go thug throughout. The art is well done and has a cherubic fluidity that gives it slightly bubbly yet sleek shapes that illustrate the actions of the characters well. The colors are bright and inviting yet with a slick effect that reminds me of an animated feature. I especially loved Devil Dinosaur’s flaming eyes and Moon Girl’s roller skating action shots. Great poses and panel layouts are fairly dynamic serving the action. What I find slightly disappointing is how quickly the six issues go. Maybe it’s the slightly action focus. For instance, the Totally Awesome Hulk guest-starring while cool does detract from the core story a little when just the fight between him and Devil Dinosaur lasts a whole issue. The parents view on Lunella’s situation is a tad one-dimensional. They don’t really give any true support beyond the standard parental orders of “go to school” and “no extracurricular activities” and only mentioning they know about her inhuman DNA and fear. They mean well, true, but there’s no true depth in my eyes to the interactions. If they actually provided some suggestions, that might have endeared them more to me. As-is , they seem to be just another foil to Lunella’s goals. While that serves plot somewhat it doesn’t really serve character to me. What it does get through is the fear Lunella has of her inhuman DNA and her skepticism and disappointment of everyday school life and her parents. Devil Dinosaur could be smarter in interaction but he wasn’t portrayed as truly dumb either. Overall, I’m impressed with the relationship between the two and would love to see more. The sixth issue ends on a cliffhanger with Lunella being confronted by the mists she fears so much. Devil Dinosaur takes care of her but it’s hard to say what the result would be. The Killer Folk had ditched their god but it leaves the question of what will they do next. And what about the parents? As one-dimensional as they had been in this volume, I’m personally hoping they’d wise up and become story-serving characters and pull some weight. 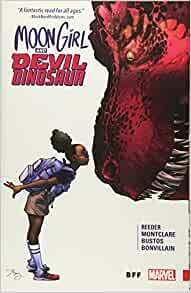 Fun story with endearing main characters and promising plot points, Moon Girl and Devil Dinosaur the series is off to a good start. I’m looking forward to what happens next. 5.0 out of 5 starsIn Love. I am a 42 year old woman. While I certainly lean towards the creative/sci-fi nerd side, I'm more of a small press Expo vs. Comicon person. I LOVE THIS BOOK. Lunella speaks to more than just women and girls, she is any child or adult. Since I was, well, Lunella's age I was reading my brothers X-Men and Doctor Strange comics and I wish we'd had characters like Lunella. Not because the others were lacking, but she is a young woman on the cusp of a life change who uses her wit and resolve to take care of herself and her family. I love it. I just love it. The humor is good, the story line is solid, and I was sorry to finish it. I tried to ration it. I really, really, did. Devil Dinosaur. Why can't *I* have one?!? If you have a kid of any gender who loves good comics, give this a try. I heard about this book for a while and after getting a free kindle credit, I decided to check it out. While it is great in the art department and the premise is nice, I did find myself wondering if I liked the main character. While her problems are there and do inform why she acts the way she does, thus lending legitimate sympathy to her character, I wasn't sure if I found her likable as a character. Also, it is revealed later that she has a secret lab underneath her school at one point and I thought "Well that came out of nowhere". Also, this is more on Marvel and how it published it, but it ended on a cliffhanger and that.. Well, I'm not too big a fan of cliffhangers. But beyond that, this was a fun little read. I liked Moon Girl's dynamic with Devil Dinosaur and found it adorable. Devil Dinosaur comes off like a giant dog that wants to please his master. You might like this. Moon girl is adorable! This was an entertaining read. This is the story about a little girl genius who spends most of her time learning and inventing because the people around her don’t care enough to try to understand her. She ends befriending a dinosaur mostly because he started to pretext her and her shinny kree gadget. Moon girl needs the gadget to help prevent her inhuman gene from activating and transforming her into a mutant ( I know this is an x-men word). I loved her character development, the drawing style used and the choice of colors. I plan on reading the rest of the series. I love that Moon Girl is a super intelligent fourth grader and that she is black. She’s one of my daydreams I used to have in elementary school: that I was brilliantly intelligent and I had a dinosaur to protect me; however, my dinosaur was an imaginary mash up of a pterodactyl (because I wanted to be able to fly away and travel the world) + stegosaurus & brontosaurus lol. I wasn’t a superhero, but a world traveler who was interested in reading, learning, science and having adventures lol. Its alright. Its a little weird that pretty much everyone, even most adults are jerky to the nine year old protagonist. That said, it was good enough to keep me reading. Liked the art style a lot, and Devil Dinosaur is kinda adorable. As for the story, it's...okay. 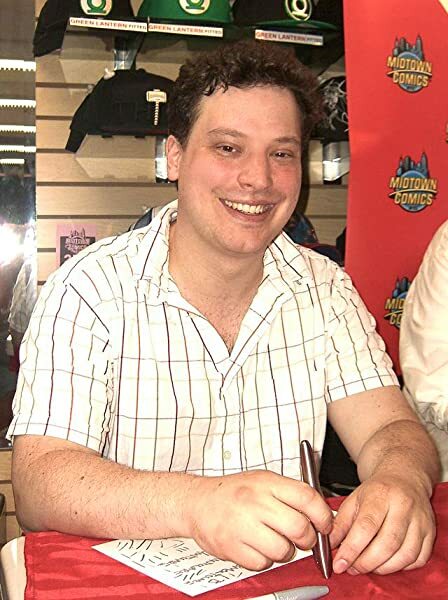 Not the best not the worst.